Tendering is obviously a very important phase of any project, and so here at T Sullivan Engineering we consider each tender individually. We don't work to a book of rates which enables us to always try to offer the best value and innovation for each project. At T Sullivan Engineering we have our own in house draftsman, we are able to supply drawing packages in 2D using Auto CAD and 3D using our Tekla modelling package; this allows us to work with architects and structural engineers to supply drawings for approval. The steel work we supply is manufactured in our workshop in Wallasey. We have a large fabrication work shop and a variety of machinery that is able to tackle the most complex of fabrications. We have a good amount of in house plant which we are always looking to expand. 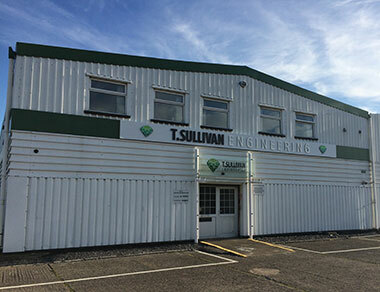 All T Sullivan Engineering installations are carried out by directly employed T Sullivan Engineering Staff, and we do not subcontract work to other organisations. The years of experience in the installation of steelwork has allowed our site teams to accumulate a large amount of expertise. Based in Wallasey Merseyside, which specialises in Steel Fabrication, Structural Steelwork, staircases, Handrails and Architectural steelwork for Industrial and Residential developments. Today we installed the first of four flue supports to the external elevation of the rapidly progressing building fabric. T Sullivan Office Get A Makeover! This video shows T Sullivan Engineering erecting circa 120 tones of steel work for Vinci Construction on a IHP project. We will design, manufacture and install the steel work on the new Liverpool Life Sciences Accelerator (LLSA), which is on the site of the Royal Liverpool Hospital.